Ships tomorrow if you order in the next 20 hours 30 minutes. Ginkgo biloba contains flavonoids and terpenoids, both of which have been found to support many elements of your overall health. 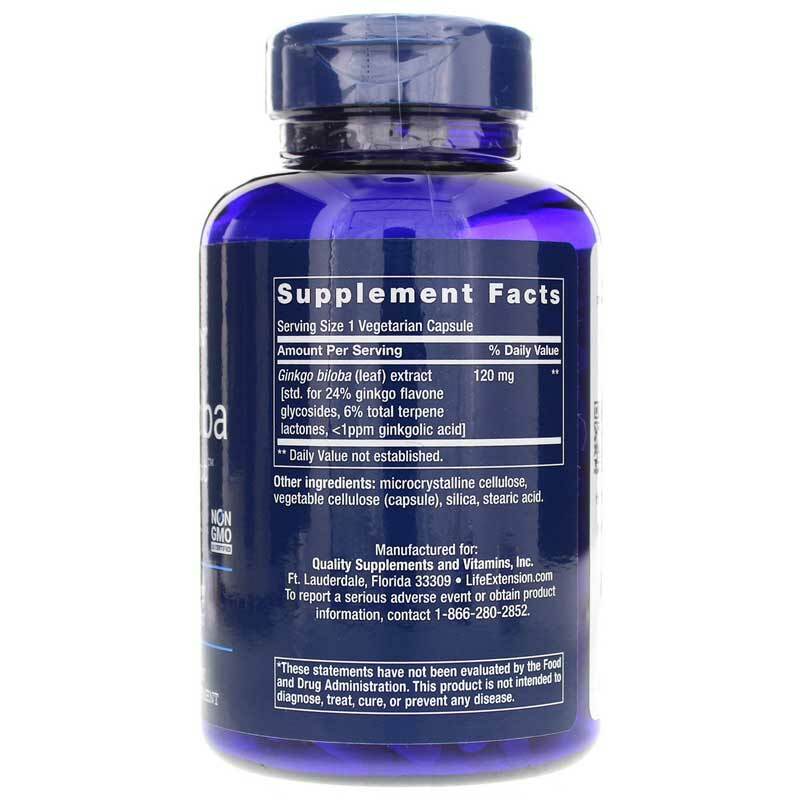 Life Extensions offers a quality supplement in their Gingko Biloba Certified Extract, which delivers 120mg of gingko biloba extract in every easy-to-swallow capsule. Gingko Biloba Certified Extract is made without any artificial colors, flavors, or preservatives, and contains none of the most common food allergens, including dairy, gluten, wheat, peanuts, and fish. Make the choice to start improving your overall health. 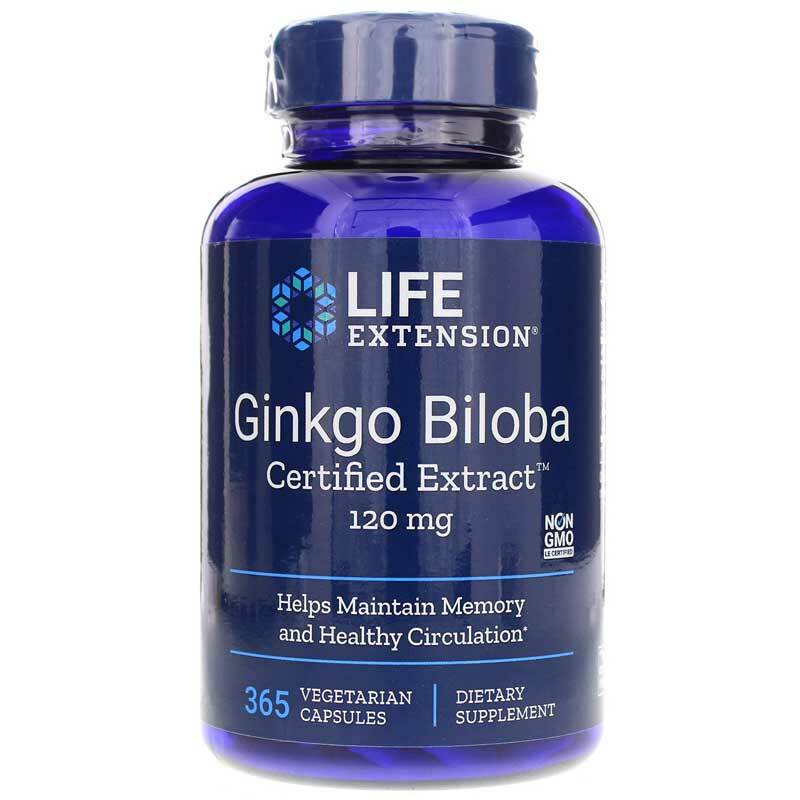 Life Extension's Gingko Biloba Certified Extract helps improve your circulation and blood vessel health, while also keep your memory and concentration sharp. Give it a try today! Other Ingredients: rice flour, gelatin, magnesium stearate. Contains rice. Contains NO: milk, egg, fish, peanuts, crustacean shellfish (lobster, crab, shrimp), soybeans, tree nuts, wheat, yeast, gluten, or corn. Contains NO sugar, and no artificial sweeteners, flavors, colors, or preservatives. Adults: Take one capsule daily with or without food, or as recommended by a healthcare practitioner. If you are taking MAO inhibitors, anti-coagulant or anti-platelet medications, or have a bleeding disorder, consult your healthcare provider before taking ginkgo. Ginkgolic acid is an allergen for some people and is present in much higher levels in lower-quality products. If you are pregnant or nursing, please consult your healthcare professional before using this product. Keep out of the reach of children.